If there were a super league of brands with special powers such as ‘cultural omnipresence’, then Red Bull would have the biggest, brightest and flashiest superhero kit of all. There aren’t many brands that can currently compete with Red Bull’s marketing consistency; whether it’s on a Formula One race track or gaining mass international broadcast attention with skydives from earth’s upper limits. In the pursuit of claiming and gaining headspace i.e. your attention, Red Bull hasn’t left many cultural stones unturned. The Red Bull Music Academy, now in its fifteenth year, has given a platform to an array of new musicians through its annual programme. 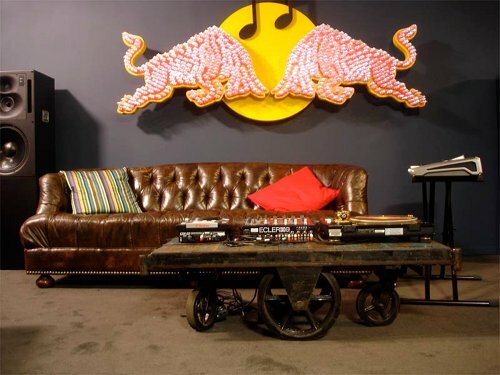 To celebrate their 15th anniversary year, Red Bull released, For the Record – a book designed by Double Standards featuring fifteen conversational pairings with some musical greats, as well as producing a feature length documentary directed by Ralf Schmerberg (What Difference Does It Make? A Film About Making Music). The film aims to reveal an honest insight into musicians’ lives, touching on both the challenges and the highs. Just like the book, the film is also a roll call of musical heavy hitters such as Brian Eno, Nile Rodgers and Erykah Badu. RB’s investment into culture continues to pay dividends, with a continuous alignment with authentic artists and creative output. And guess what that equals? Stellar content.